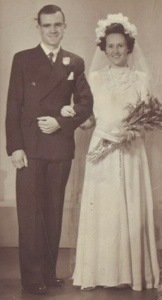 This is a picture of my gorgeous Grandparents on their wedding day in 1948. Today is the 16th anniversary of my Gran passing away and last Saturday was the 5th of my Grandpa. I miss them both every day but I know how lucky I was to have them in my life because not everyone does. They taught me such good values, morals and the importance of family. I know they are both looking down on us all and keeping a wee eye out.